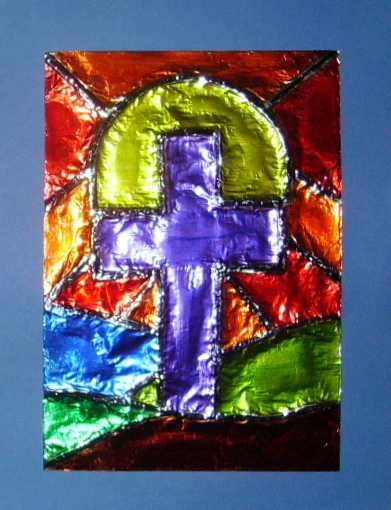 These beautiful Lenten pictures are made using tinfoil and permanent markers. This is quite an outstanding project which I think has a Tiffany style look. I have listed this, “Lenten Tiffany-Style Art,” in the 6th Grade Projects Gallery in the sidebar, but younger kids could do this also. This entry was posted in 6th Grade and tagged 6th grade, art and craft projects for children, childrens art projects for lent, easy lenten art, lenten crafts for kids, lenten tiffancy style art, tiffany art for kids, tiffany style, tiffany style art for kids for lent, tinfoil. Bookmark the permalink. I’d like to try this with my granddaughter who thinks she is too old for those children’s crafts (She is 9).